The Utva 75 is a compact, piston engined aircraft manufactured by UTVA. It was mainly used as a military basic trainer aircraft. The Utva 75, was designed to replace the UTVA Aero 3 as the primary basic trainer in the Yugoslav Air Force. Over a hundred units were built and served in the former Yugoslav Air Force. After the dissolution of Yugoslavia, many were passed on to the succeeding countries. The last two Utva 75's were produced in 2003 and exported to the United States. 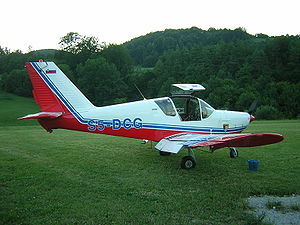 Utva 75 : Two-seat training aircraft. Utva 75A : Four-seat light aircraft.